Recall Ugo from the hand incident at le 47? We met up recently at the preselection for the Trophée du Bar at the InterContinental Paris Le Grand Hotel. As it happened it was also my birthday, so while waiting for him, I decided to indulge in an anniversary-of-my-being-born martini. Upon sitting down, I was ready to love up this somewhat spendy hotel bar. First impression: upscale, rich red in an under-the-radar-ish locale, a bar/lounge area that spans the entire first floor lobby and an “original dry martini” on the menu comprising Tanqueray, vermouth and a few dashes of orange bitters! A few interesting gins on the menu and a selection of classics (Sazerac, vieux carre, etc) and house creations. Service was top-notch hotel-worthy and I ordered my dry martini. But apparently should have specified I wanted the “original” martini that was listed on the menu. I watched the bar-lady stir up a martini with Gordon’s and then pour it into a Grey Goose glass. I payed 20 Euros for a sponsored cocktail glassful of bog standard gin. For 2 Euros more, I could presumably have had the better martini but wasn’t given the option and didn’t realize until after that in addition to the ‘original dry martini’ there is ‘dry martini’ on the menu, so I guess I should have specified. Ugo arrived and we dropped down to the smaller bar downstairs to watch the participants mix up drinks. The crowd was fun & some interesting cocktails were being created. But I was still cranking a bit after paying 20 Euros for a martini made from a bottle of gin that in its entirety (at grocery full price) costs significantly less than the price of my drink at le Grand Hotel. The annoyance lasted only briefly, because – really – who wants to be cranky on their birthday!? But, I do like the space and will pop by again to try the original dry martini. Have you ever returned a drink when it didn't suit you? 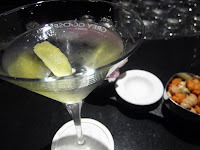 I was at the Plaza Athenee and the cosmo was too sweet. At those prices, in retrospect, I wish I had had it remade. Yes, I have returned a drink (especially when the prices are that high) but it usually has to be for a good reason & it doesn't happen very often for me because I usually take a pretty good look at the menu and know what I'm getting. in this case, I didn't really notice that there were a couple of options, so I'll let them slide. I was just talking to a former barman from the Plaza Athenee and he mentioned that the goal is to please the costumer, so I'd feel okay taking something back and asking for a bit of tweaking (politely of course…sometimes it really is about personal taste). But in general, if i ordered something I've never tried and just simply don't like it, I have a hard time justifying returning it – but in your cosmo case, I think it definitely would have been okay to let them know it was too sweet for you and ask them to doctor it up a bit. When you put it into perspective like that (price of bottle vs price of drink), I can understand being a little miffed. I'm glad you you enjoyed the rest of the your birthday evening, although your anniversary-of-being-born Martini didn't come up to standard. Do you know that before you lived in Paris Dayne & would go there for champagne? Wendy I didn't know that! it's a good spot for that. also, for champers the Dokhams champagne bar is fun! incredible! we Would like to try. Orange bitters and vermouth is a good combination. Thanks for the idea.